Eugene Onegin, OperaUpClose. Review by Barbara Lewis. Tchaikovsky said his aim in creating an opera from Pushkin’s supremely Russian yet universal drama of ill-fated love was to relay “ordinary, simple human feelings” as opposed to lavishly theatrical action. It’s an aspiration perfectly in keeping with the production values of OperaUpClose and the talents of librettist Robin Norton-Hale, whose wit, crystal-clear English translation and transposition of the action from 19th-century Russia to London and its suburbs means whatever we lose by way of high-flown poetry, and, for purists, authenticity, we gain in immediacy. Under the direction of Lucy Bradley, the production also drives home the feminism of a heroine who dares to try to shape her own destiny by setting the action in the years that saw a shift from the vestiges of 1950s home-making to the liberation of the 1960s. We begin with an emphasis on female domesticity. While Tatyana (a perfectly-cast Lucy Hall on the night I attended) switches between reverie and reading, a chorus of women of the older generation are gossiping and gardening, with Marigold gloves, shears and a decorously pink lawn-mower. They have all loved, lost and moved on with laudable practicality. 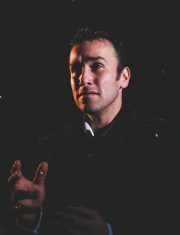 The pared down OperaUpClose format allows for maximum heterosexual impact as not a man appears until Lensky (Cliff Zammit Stevens) bursts on to the scene with Onegin (Tom Stoddart). Just in case we miss the contrast between the earnest Lensky and the caddish Onegin, Zammit Stevens wears comedy glasses, while Onegin is too smooth in a sharp suit and suspiciously shiny shoes. The chemistry between the lovers is instant and only a fool would deny it, but then Onegin emotionally is a fool however beguiling Stoddart’s baritone is as a complement to Hall’s soaring soprano. The question is whether any of this emotion is real. Certainly it is to Tatyana, whose decision to write a destiny-shaping letter is at once a student all-night essay crisis, which strews her suburban bedroom with screwed up paper, and one of the most challenging, sustained and powerful operatic arias of them all. The tragedy of Onegin is his inability to confront what he has inspired. It’s somehow easier to fight a dual with his best friend Lensky. First we have a birthday party, as opposed to the grand name-day ball of Tchaikovsky’s original Russian version, which ends in powerful harmonic confusion, forcefully conveyed even by a bijou cast and orchestra, as the run-up to Lensky’s long, lonely wait in the snow for his duelling partner. Poignant and vulnerable, Lensky is now without his glasses and at first locked almost in a lover’s embrace with the friend he is too proud to pardon. Emotionally, it’s an almost exact precursor of the bitter end when Tatyana refuses to forgive Onegin even though it would be so emotionally fulfilling to do so. Unlike the Tatyana of Pushkin and of Tchaikovsky who is married to an elderly prince, this Tatyana is a successful writer and worldly sophisticate, signing copies of her newly-published book, who can actively choose to live without Onegin. It’s a triumph for Tatyana, but what jars is that it makes this production only a tragedy for Onegin. Feminists may rejoice, but the victory is hollow when we are probably no closer to cracking the secret of mutual happiness than in 19th-century Russia.